Aparna of My Diverse Kitchen chose Sheermal for our group We Knead to Bake for the month of November. Had I heard of sheermal before? Yes, but and I had written it down to try it out. I had come across the recipe for sheermal by Tarla Dalal and Sanjeev Kapoor. So when I went through the recipe that Aparna gave us, I was pretty excited Finally I was going to bake Sheermal. In the meantime other members had already baked it and shared a few of their experiences. Most of sheermal photos sent to our facebook page looked so perfect, delicious, well baked and rich. I made mine today. 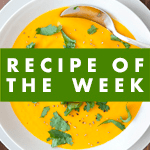 I must admit that I had totally forgotten that we had to post the recipe today on our blog. I had presumed that I still had till the end of the month. A gentle reminder from Aparna, made me sit upright. So early in the morning the dough was kneaded and by lunch time hubby dear had lovely sheermal with corn curry. What is sheermal? Well, sheermal, seermal or shirmal is a flat bread much like the naan made of plain flour and milk and saffron. Its presumed that it originates from Persia and is now baked in the tandoor, tawa or oven in most areas of Pakistan, Bangladesh, Iran and India. In India it probably was introduced during the Mughal period or brought down by the Persians. It was mostly prepared in Lucknow during festivals and for royalty banquets.Nowadays its a part of the Hyderabad, Lucknow and Awadhi cuisines. Sheermal is eaten on its own with tea or with curry. The topping besides the saffron infused milk can be anything from poppy seeds to almonds. 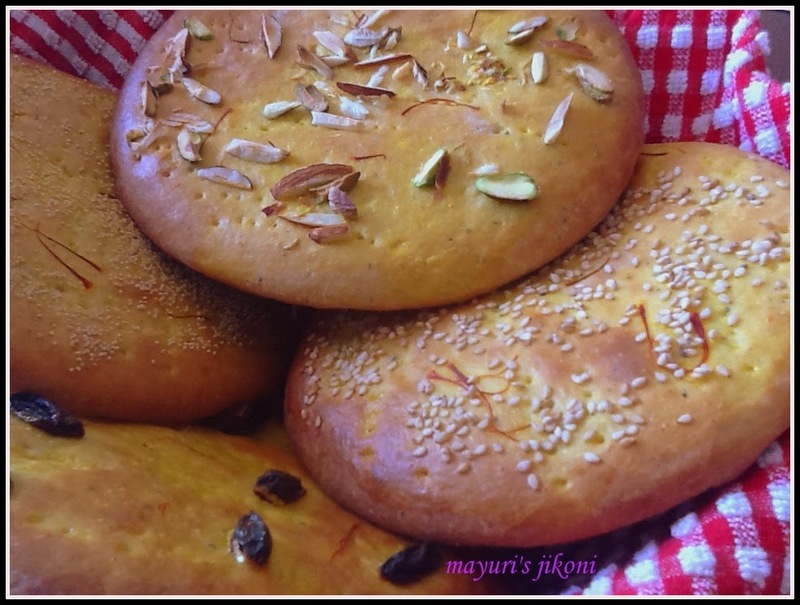 While I was baking this bread, my whole house was filled with the scent of cardamom and saffron. Most recipes add rose water or kewra. I didn’t have either so I added cardamom. Here is the recipe for the soft, rich textured and delicious flat bread. Add saffron strands to the hot milk. Cover and leave on the side till required. Mix flour, salt, cardamom powder and sugar in a bowl. Add half the quantity of ghee and rub it into the flour. Add yeast to the flour and mix it well. Add the beaten egg and milk. Form a dough. The dough should be slightly sticky. Using the rest of the ghee, knead the dough till it smooth and silky. Cover the dough with a cling film and let it rise till its double the size. Mine took about 1½ hours. Divide it into 4 parts. Roll each part into a ball. Let the dough balls rest for 15 to 20 minutes. Pat with your fingers or roll each ball into a circle of 6″ in diameter and ⅛ ” in thickness. Place the rolled dough onto a greased baking tray. Repeat steps 13 to 14 with the remaining dough. Prick the discs all over with a fork. Brush the tops with the saffron milk. Bake for 10 -15 minutes till the tops are golden brown. Remove the bread from the oven and let it cool slightly on a wire rack. Brush the tops with ghee or melted butter and serve. If not serving immediately, cover with a cloth and leave in a bread basket or tin. If you are using kewra or rose water, add it to the flour along with the milk and egg. Can be prepared without eggs. You may need more milk, depending on whether you are adding the egg and also on the quality of flour. I used all the toppings but you can choose to use any or none. I would probably add a bit more sugar next time if I am going to serve sheermal with tea. Kewra or kewda is the extract from the panadanas or screw pine tree flower. It is a transparent liquid mostly used as a flavouring in the north India. Its added to curries, desserts, sweets and drinks. If you are not using instant dry active yeast, you need to activate the yeast by adding it to the warm milk with a bit of sugar. Leave the mixture for 10 minutes till it is frothy. You can make smaller size sheermals. I have never eaten sheermal but I can feel the taste of saffron already 🙂 beautiful bake!